Bentley Consulting Group Hosts Consulting Professor Panel on Dec 4th! The Bentley Consulting Group will be holding their final event of the semester on Tues, Dec 4th. 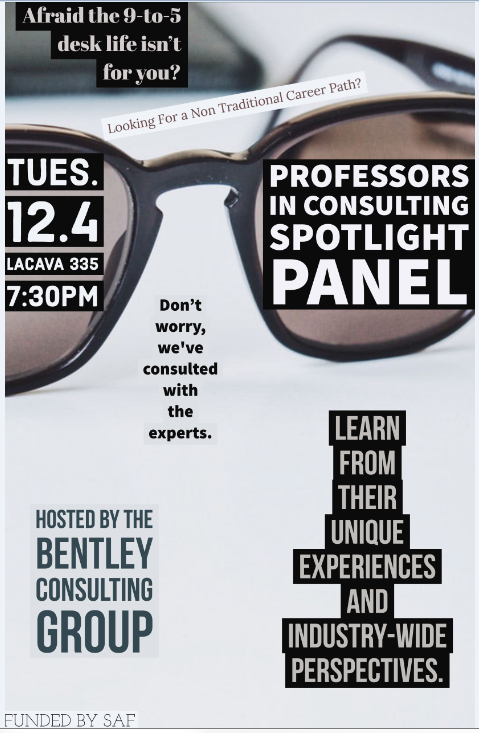 All students are invited to attend their Professors in Consulting Spotlight Panel at 7:30pm in LaCava 335. Great opportunity to hear from multiple Bentley Professors about their experiences within the Consulting industry. Please RSVP by emailing GA_BCG@bentley.edu.